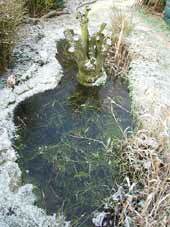 1 March - A very cold night, with air temperatures down to -2.9C meant that the pond was frozen over again this morning. The picture, taken from the house end of the big pond, contrasts with the photograph taken on 27 February. Then, we had snow falling on an already frozen pond and melting on the surrounding ground. This time it's the reverse, as the snow fell last night, before the pond froze over. This morning's sunshine has lifted the air temperature to over 6C, but at mid-day ice still covers most of the water surface. As I checked the pond this evening I think I saw a small amount of frogspawn below the place where I photographed the frogs on 29 February. Unfortunately it is under the ice so I will have to wait for temperatures to go up a bit before I can confirm it. 4 March - What a difference a day makes - there was still a bit of ice on the pond at 9pm last night, but a low of some 5.2C last night meant that there was no sign of it this morning. Also there was a sort period of heavy rain during the night, brought in by south/south westerly winds. Now that the last of the ice has gone I can confirm the presence of a very small clump of spawn that was presumably produced during the activity on 29 Feb. However, it is deep down in the water and does not look to be in good condition. Today the frogs are much more active, with quite a few spending time out of the water and a great deal of croaking going on. 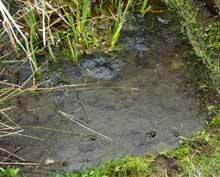 The shallow end of the pond has turned cloudy as the frogs have churned up the muddy bottom. Tonight I tried to count them but they are very nervous and are ready to dive at the slightest movement. 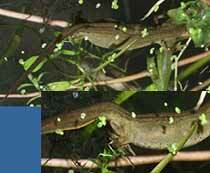 The newts are very active, I saw at least eight in just one small area. 5 March - On a dull, overcast morning, the air temperature of 4.8C at 8am is the lowest it has been all night, dropping below the water temperature which is 5.2C. The first healthy looking frogspawn has appeared in the shallow end of the big pond. The eggs themselves look very large in the photograph because the jelly layer (albumen) has only just started to swell up as it absorbs water. 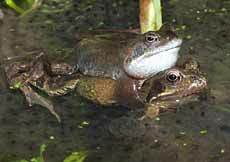 By this afternoon there were 90+ frogs to be seen in the two ponds. They are making a lot of noise now at it seems that the presence of the first spawn is attracting many to the shallow end of the big pond. This picture shows the area around the spawn pictured above and you can see a second clump that has appeared during the day. The cold spell has put the frogs about six days behind last year, but if temperatures stay reasonable (reaching between 9 and 10C today) I would expect to see a lot of spawn produced over the weekend. Back in the deep end there are several groups of males trying to win the tussle to be the one that fertilizes the eggs that a female is close to releasing into the water. This group has been rolling about, with others coming and going, for at least 15 minutes. The female is the one with the red 'dress'! 6 March - Just a short entry today. Another two clumps of spawn have appeared, but the temperature was marginally lower than yesterday. 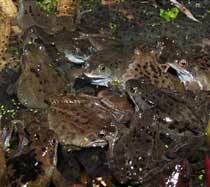 I tried counting the frogs twice during the day and came up with totals of 95 and 96. Some certainly dived when I approached so we could well be near the magic 100. Last night, when I checked the pond for the last time I spotted these two inhabitants that can easily be overlooked with all the frog activity going on. On the left is a caddis fly larva which only revealed itself when I saw the dead leaves moving. 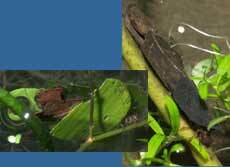 You can just see its head and front legs to the right of the dark leaf. 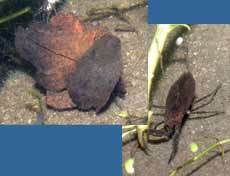 The pond scorpion on the right was happily moving about in the open. 7 March - After a dull start there has been some sunshine to encourage the frogs today. There must be eight clumps of spawn now, but there is a long was to go to equal last years' 'harvest'. 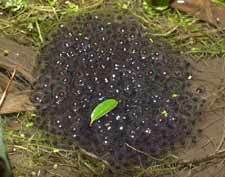 The shallow end, where all the spawn is appearing, is a busy place with frogs dashing back and forth between any movement that may mean a female ready to spawn, although they do spend a lot of time gathered around existing spawn waiting for something to happen and doing a lot of croaking. In the deep end there are a lot of individuals spread over the surface, and occasionally an outburst of passion disturbs the water as a female is surrounded by a gaggle of males. This time the female is as drab in colour as her suitors - her nose pokes out at the bottom of the picture. The males are now at the stage where they will try to grab at anything that moves, so that they will swim towards where I am at the side of the pond, especially if I disturb the surface with my finger. Sometimes they seem to be oblivious of what it is they are holding on to. 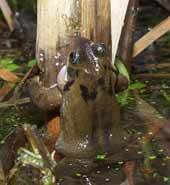 In this case the poor thing, caught by the camera in the middle of a croak, held onto the plant stem for over 30 minutes before it was bustled away by other frogs. I read in a newsgroup that they have even been seen to embrace goldfish! Tonight, clear skies nd a northerly breeze have brought the air temperature down to less than 2C over the pond, although the water is still at 5.2C. 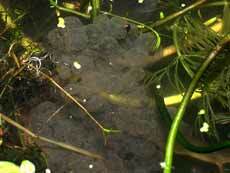 The frogs are far less active now (8.30pm) and many of them have retired under the surface. I can count 10 clumps of spawn now. 9 March - Today was quite a cold day and at 3.30pm both water and air temperatures were the same at 5.6C. However, tonight the water temperature has dropped to 4.2C and the air to <3C at 9pm. Also, there has been a chilling North/North-Easterly breeze. 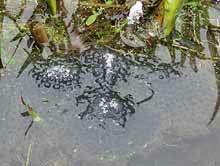 There has been a doubling of the frogspawn mass over the last two days, but activity has been reduced, especially today. Tonight there are very few frogs in the shallow end. 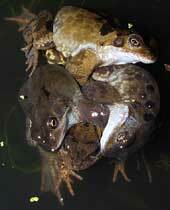 The colder conditions may well be having an effect on frog activity. I would be surprised if we had reached the end of the main spawning - there was a lot more last year. 10 March - After a frost last night it has remained cold (max around 4C) and I saw only two frogs all day! The forecast is for this cold spell to continue. 12 March - Snow and rain last night raised water levels to their maximum, but there was no ice on the pond, just these snowy caps on a bit of the spawn. The frogs had completely vanished into the deeper water ( it must be crowded down there!). The snow disappeared quickly this morning. The air temperature reached 5C by lunchtime and on a mostly wet day it has stayed the same ever since . By this evening the frogs were back on the surface, croaking again and very active, but heavy rain is preventing me from spending time by the pond tonight. 13 March - Last night the outside temperature didn't drop below 4C and this morning's sunshine took it up over 9C, although squally showers have meant that it has not been all good. 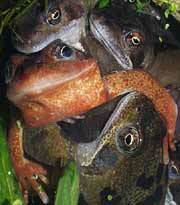 The frogs have reacted to the improved conditions and they are out in force. It is impossible to do an accurate count but I definitely saw at least 120 when I checked the pond at noon ( I counted twice to confirm this). This is the largest number I have ever recorded here. They are everywhere in the pond, with some out of the water around the sides, but the main gatherings are once again where there is already spawn. There is new spawn which must have been produced last night and the frogs are as eager as ever to find a partner, so I look forward to a lot more spawn soon. The frogs may be glad to hear that the current weather forecast suggests that temperatures will be up into double figures over the next few days, perhaps as much as 16C! 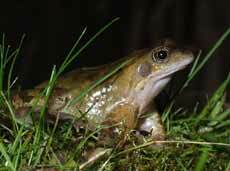 14 March - A dull, damp and windy morning after a night when the temperature didn't drop below 6C and when I opened the door out into the garden the croaking of the frogs could be heard from the pond, despite the rustling of the trees. Last night I spent a bit of time watching the pond for other activities. 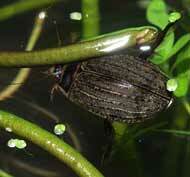 One of the first things I spotted was this water beetle which only stayed visible long enough to grab this blurred image (no large version). Measuring just under 2cm in length, it looks very similar to the one I rescued from a bucket in May last year, but I will need to get a better picture to be sure. Rather more cooperative were a couple of caddis-fly larvae. The right hand individual seems to have chosen old leaves to build its 'home', while the other has also been cutting neat chunks of fresh leaves. Each structure measures about 3cm in length. I saw five others moving about as I watched. Finally, there was a decent amount of newt activity, although there was no sign of displaying going on by the males, one of which can be seen in the upper image. You can just make out the frill along its back. It seemed more interested in hunting than the females that were nearby. 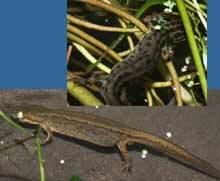 The lower newt is one of those females. Tonight I have managed a couple more newt photographs, although picture taking was made very difficult by the amount of frog activity going on - every time I moved the camera near the water it seemed that a frog arrived to investigate. This first is a clearer image of a male with its frill not yet very prominent. These images are of a female. She remained in the same position for a while, even with a frog pushing past, and from the positioning of her hind legs it appears that she may have been egg laying. The beetle reappeared but a frog thwarted any hope of a photograph. 15 March - Today, it is dull, damp and with the air temperature almost 12C this afternoon, the water temperature is now up to 9.7C. We seem to have passed the peak of spawning now. There is more new spawn today, but as this picture shows, the shallow end of the pond has periods of quiet now - only eight frogs in the image. You can see spawn piled up around the central plants, the bottom is covered, and there is more between the plants on the left. Although there is quite a lot I don't think we have anywhere near as much as last year, despite the larger numbers of frogs here. While the shallow end is quieter, there is still a lot going on in the other half of the pond. This panorama on a part of the far bank shows some eighteen frogs, all intent at looking out for something beyond the confines of the pond. It seems strange behaviour, the way they seem to group together like this as though they are hoping for some new arrival. As long as I do not disturb them, groups like this gather all around the the pond edges, staying together for ages, often until disturbed by the movement of another frog. I wonder whether there could be a shortage of females (or is it a surfeit of males) and these (males?) are still hoping for a chance to mate. If spawning really is over I would expect shortly to see frogs leaving the pond to hunt, especially if the wet weather stays for the next few days. 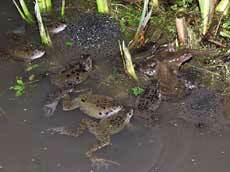 Tonight many of the frogs were back in action down the shallow end. Despite that I again had trouble with them dashing about as I tried again to photograph some of the other inhabitants. I did get a better look at the beetle I saw yesterday. It is (I think) an Acilius sulcatus, fiercely carnivorous and found in ponds and slow moving water. 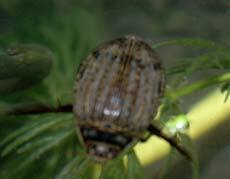 The ribbed back (elytra) means that it is a female - I shall have to watch out for any males that might appear. Right at the edge of the pond was this Water Scorpion, with its hollow 'tail' protruding through the surface film of the water as it breathed.